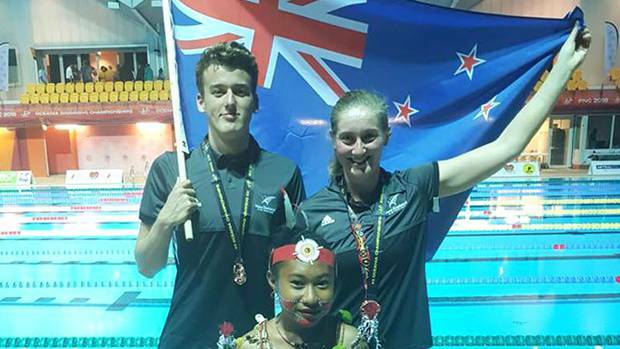 Swim Rotorua open-water specialist David Boles has secured New Zealand's first medal at the Oceania Swimming Championships. Boles, who was making his international debut, produced a very strong performance to take bronze in the gruelling 5km race around Port Moresby harbour in Papua New Guinea. The event involved swimming four laps of the 1.25km course. It was neck and neck at the end of lap one with Boles locked in a tight battle with his Australian rivals. At the end of lap two there was a small gap which grew over the last half of the race. Head coach Alastair Johnson was very pleased with Boles' performance. "David has prepared exceptionally well. He has trained faster, improved his technique and has made good gains in the gym. "Winning a bronze medal on your international debut is a fabulous achievement, and we are all very proud of him. He is very popular with his teammates, and especially our up-and-coming juniors, who he was coaching earlier this year. "I have no doubt that our juniors will look to emulate David in a few years' time," Johnson said. Boles' next race is the open water 10km race on Saturday. Meanwhile, Swim Rotorua's junior swimmers have made a splash at the Swimming Bay of Plenty Winter League for swimmers 12 years and younger.